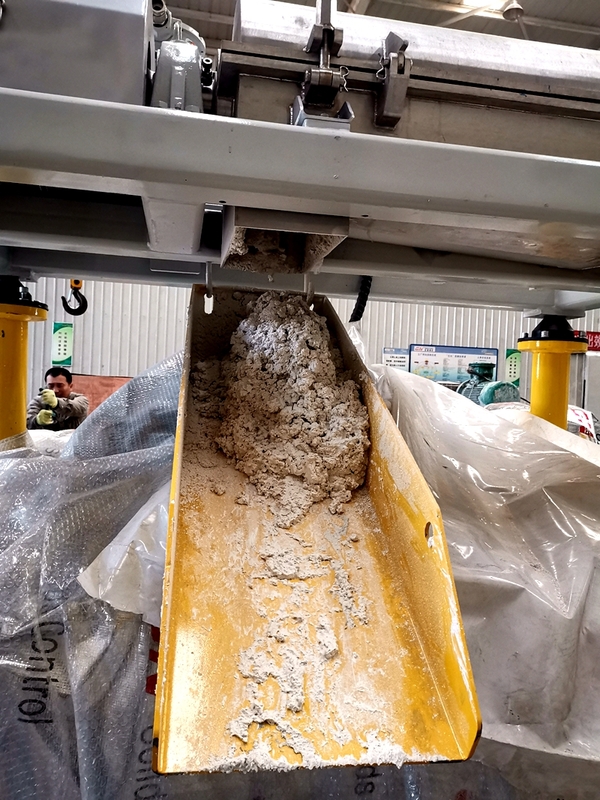 Last week we have a trial centrifuge for Aluminum Hydroxide Slurry Separation for our client, the client express their samples by international courier. 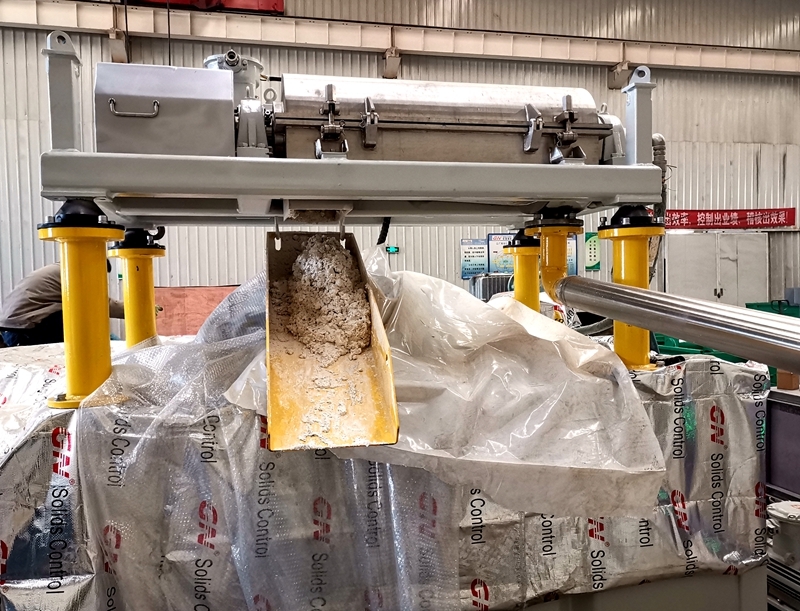 We prepare for the decanter centrifuge installed on a mud tank with Netzsch brand screw pump as feeding pump, and prepare the dilution Aluminum hydroxide fluids by another mud tank with a mud agitator installed on it. The agitator keeps agitating the fluids to prevent it from deposition. The VFD control panel is power on and set the bowl speed and differential speed, also adjust the feeding pump motor frequency to control the flow rate. At the beginning the flow rate should be at lower level, once the centrifuge working steadily and the solids discharged from the centrifuge discharge port, the flow rate could be increased. 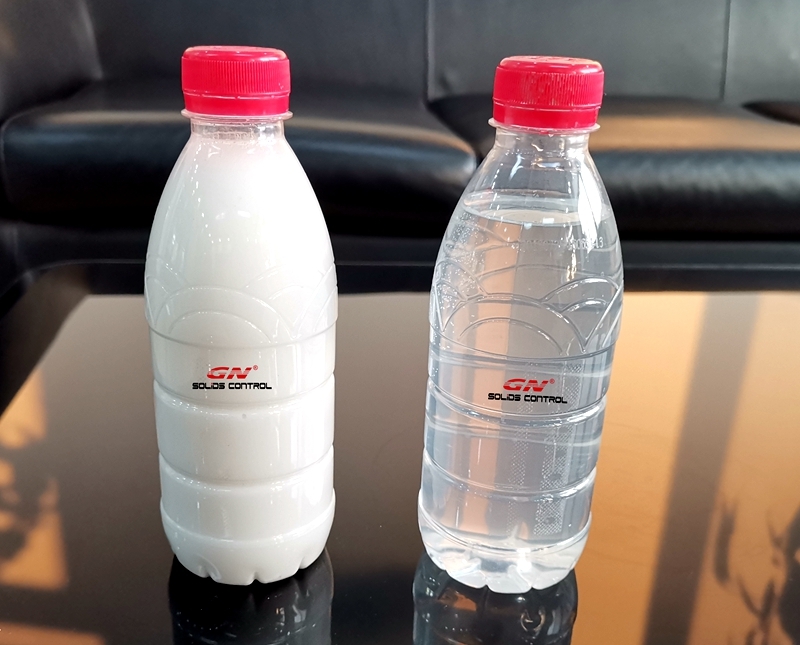 Below is the photo comparison for the fluids before treatment and after treatment. Below is the discharge solids from the centrifuge. The trial centrifuge model is GNLW224D-VFD with single motor, the main motor power is 11kw, GNLW224E-VFD decanter centrifuge is an ideal option for waste water treatment, with both main motor and back drive motor, it is easier to adjust the differential speed, the smallest differential speed is 1 rpm, it can ensure the separation performance to get clear water and drier solids. And the cone drum angle is customized for different material treatment to get better result. For larger treating capacity, we have 14 inch bowl GNLW364D-VFD decanter centrifuge, 18 inch bowl GNLW454D-VFD, 22 inch bowl GNLW554D-VFD for option. All of these centrifuges with longer bowl length to ensure the good performance, drier solids separation, clear discharged water. The VFD control panel installed on the decanter centrifuge to adjust the frequency of the main motor, back drive motor and pump motor to control the rotary speed of the bowl, screw.